Planning ahead for the Michigan Challenge Balloonfest, June 27-29 in Howell, has never been easier. Balloonfest guests who want to save some money by purchasing a weekend parking pass in advance can now order online at www.99mainstreet.com. 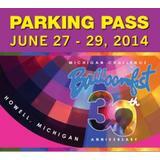 Discounted weekend parking passes are also available until June 26 at the Howell Area Chamber of Commerce. The discounted passes sell for $20, and allow entry into the event for all passengers in the vehicle. Purchased at the event, located at the Howell High School campus, 1200 W. Grand River Ave., the weekend passes cost $25. Daily passes are $14 each. 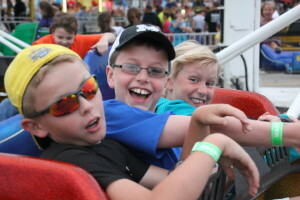 For those who like thrilling carnival rides, discounted arm bands for the Wade Shows can be ordered online from the link on the homepage of www.michiganchallenge.com or www.wadeshows.com. Need help planning your balloonfest weekend? Guests can get updated event information at the new www.michiganchallenge.com. In addition to the website, guests can like the Michigan Challenge on Facebook and follow us on twitter @balloonfestMI hashtag #balloonfest. To receive updates by phone, text “follow balloonfestmi” to 40404.